Good opportunity for travelers in Ireland to explore beautiful Cuba when traveling out of classic tourist season available with Air France-KLM! Althought this is not a shockingly cheap it is still good offer as promo deals from Ireland to this Caribbean destination are quite rare..You can depart either from Dublin or Cork to Havana, Cuba. Return flights will cost you already €480. This is including all taxes, meals and hand bag. Checked luggage for extra fee. Consider this offer especially if you appreciate departures from Southern Ireland.. If interested in this discount deal with Air France-KLM you will find the cheapest flights when departing from Ireland to Havana, Cuba in May and June or September, October and first half of December 2019. Min stay 4 days. Max stay 3 months. No free stopover available. No bag in hold in base fare. Fare class Feeder / Intercontinental leg is “L , G“. Air France-KLM promo sale is running till 13th of May or until sold out..
You can book your accommodation in Havana, Cuba via Booking.com. Also you can further discount your hotel when using one of following promo codes. 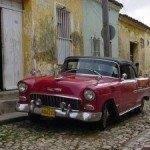 Booking sample of Air France-KLM return flights from Ireland to Havana, Cuba from €480! In this case you would depart from Dublin to Havana on Saturday, 18th of May. Inbound from this Caribbean island back to Ireland via Amsterdam on 3rd of June 2019.